What is the cost of Professional Photography? We love what we do, however couples do not understand the cost involved with professional wedding photography. Wedding photographers have years of education and training just like any other profession. Some study photography for 4 years or even longer. 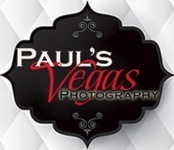 For Paul and Lisa at Paul’s Vegas Photography education is an ongoing and continuing process. This week we are updating our knowledge at WPPI at Mandalay Bay. Every year we take classes and study with some of best in the business and strive to bring it to our clients. A lot of times couples are only aware of the amount of time the photographer spends at their wedding. The time that is invested in photography is not just what you see when your photographer is pointing the camera at you. The final images do not just appear as a final product without timing, lighting, calibrating, and adjusting. Wedding Photography takes many hours after the images are taken to make a final product. The hours that are spent after the wedding are never taken in to consideration. On the average, a wedding that is 6 hours of photography time takes another 24 hours to complete. Some photographers offer to give raw images right out of the camera. This saves those photographers a lot of labor, however the product you would be receiving is not the quality you receive with us at Paul’s Vegas Photography. Another factor that goes into the cost of professional photography is the equipment which does not come by easily. The cost of professional equipment to do a wedding correctly takes several different cameras, lenses, flashes, diffusers, and all the other things that are brought to the wedding. On the average, a professional wedding photographer will invest in over $10,000 of equipment. Quality wedding photography requires current updated and top of the line equipment. We have seen weddings captured with consumer cameras thinking that they will get the same result. The reason we have seen these weddings are couples have asked us after their weddings to view and correct images that were taken. After the fact is not what you should have to deal with. And most of the time they cannot be corrected as the images are not in a professional format. Wedding Photography is a specialty within photography. You might have a friend that is a photographer that specializes in babies, children, food, or whatever. When it comes to wedding photography it takes years of experience including posing classes along with lighting to get it right! Also understand that Las Vegas, Nevada is a challenge that most photographers struggle with if they have not worked with hard sunlight. Having the correct equipment to deal with the harsh sun in Las Vegas is critical to get the best images possible. Next time your photographer explains why the cost for your Wedding Photography is X understand that we put time effort and care into what we do as professionals. If you would like more information please call us to discuss all your Wedding Photography needs! 702-330-5838 We can also help with questions about venues, flowers, party planners etc.